Like most people I have a love/hate relationship with technology. I love waking up in the mornings and checking my Twitter feed and the news but I hate how the distraction can make me run late. I love the satisfaction of hitting my step goals but I hate that I feel compelled to log what I eat. I love being connected to other people but I hate the guilt that comes with not responding to something right away. These situations are not unique to me but that doesn’t mean it has any less of a personal impact. Technology, for all of its benefits, has a lot of drawbacks which have been studied more and more over the past several years. Parents who live a distracted life tend to foster that distraction in their own children. Always looking for the next like or favorite on social media can impact self-esteem. And let’s not forget that screen time can interfere with concentration, productivity, and even our sleep. We know these things, yet we continue to incorporate more and more technology into our lives, myself included. So why do we do it? 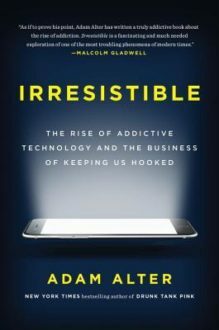 Irresistible by Adam Alter takes a fresh look at how technology impacts our daily lives and why we let it happen. While he covers the more popular subjects that were mentioned above, he also delves into the psychology and biology behind our obsession and how anyone can fall victim to it. Using approachable and practical examples that everyone can relate to, Alter analyzes how outside forces and our own biology help foster the love/hate relationship. 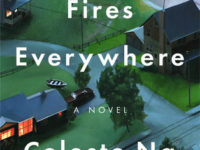 From games and apps designed to keep us hooked to the constant elevated heart rate that checking our work emails creates, he covers the spectrum of our obsession and shines a light in how even the most self-aware user often ignores the warning signs. There are plenty of articles online about how to step away from the Internet and connectivity, but doing so can do a lot more for your health than just improve your state of mind. For example, the average person checks their work email 36 times an hour and opens it within six seconds. What does this mean for productivity when it takes up to 25 minutes to get back to productivity in the first place? Imagine what we could accomplish if we just turned our notifications off. And what about wearables? After reading this book, I stopped wearing my FitBit because I realized I would pace my house at 11 PM in order to hit my step goals. It was tough at first because I like accomplishing things and those little green stars are very rewarding, but in hindsight I see how it was interfering with my sleep because I was elevating my heart rate before going to bed. Technology is amazing, and Alter does not advocate for giving it up, rather using it more responsibly and being aware of how you, personally, react to it. If you find yourself ignoring your own health for the benefit of a step goal, then it’s time to step away. If you find yourself ignoring your children because you want to check Facebook, then it’s time to step away. The repercussions of not doing so go far beyond our personal mental well-being and can impact our health, our relationships, and more. So while I may not be giving up my cell phone anytime soon, I am taking steps to rely on it less. After all, my health relies on it. Recommended for: Anyone concerned about whether they are too reliant on technology.